Our very active Junior Grange will meet at 6 p.m. Friday, July 1st. The boys will provide a fun program! Over $900.00 was donated to Kaycee Chesters and family from two fundraisers spearheaded by our Juniors. Kaycee, 10, is in the 5th grade at Sterling Community School and is battling cancer. Kaycee has returned to school, has a prosthetic leg, and is jumping rope! She is one brave little girl! She has also become a Junior Granger! Hurray! The Juniors meet August 5th (“program “Getting Ready for the Fair!”). Then on Sat., August 13th, we hold our 34th Community Grange Fair! This year the local Fire Departments have agreed to participate as well as the Scouts! We will also be entertained by “Animal Experiences” with a variety of hands-on animals. As always, great food in the Grange kitchen! Everyone is welcome to bring entries Friday, August 12th 3-6 p.m. The Fair runs from 9:00 a.m. until 2:00 p.m. Questions on the Fair, call President, Link Cooper 860- 564-1821. Our Grange will have a booth at Brooklyn Fair August 25th-28th—stop by and say hello (and enjoy our food too)! Lyme’s Junior Grange members just finished collecting for the soldiers overseas. 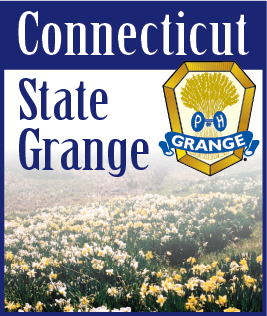 They have been getting people to help support the State Grange Agricultural Contest on growing fruits and vegetables. This week they went down to support the Special Olympics in New Haven. Their big project this year is to take a veteran fishing at the Bozrah Rod & Gun Club on October 1, 2016. They are teaming up with the American Legion Post 180, Lebanon Boy Scout Troop 180 and 58 Lebanon Lions, BRand GC, UTC-4Vets, Take a Vet Fishing Eastern CT Chapter and Lyme Grange #147. If you are a Vet and want to go call Bill at 860-885-4459 or Ted at 860-908-4906. They have raised money to buy the Vets fish to put in the pond.